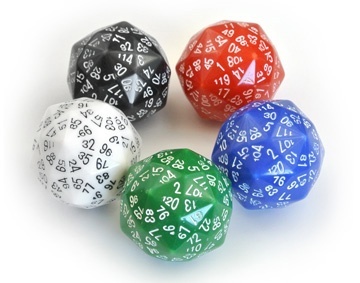 The d120 is the ultimate fair die allowed by Mother Nature (i.e., mathematics)! 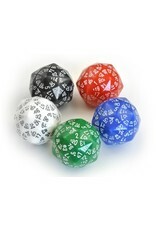 The d120 is based on a polyhedron known as the disdyakis triacontahedron. Each face is an elongated triangle. These dice are perfectly numerically balanced, with the same sums for numbers around vertices of the same type. Available in black, white, red, green, or blue.